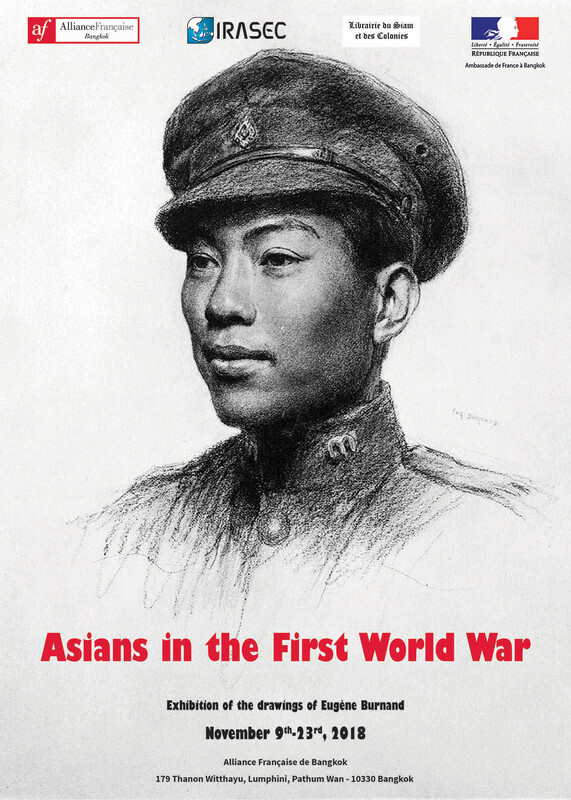 Thanks to François Doré from the Librairie du Siam, the Irasec and the Alliance Française are pleased to present 10 original portraits of Asian soldiers painted by Eugène Burnand (1850-1921). They are part of his collection of soldiers of the Great War drawn between 1917 and 1921 by the Swiss painter. After studying at the École des Beaux-Arts in Geneva and in Paris, the landscape painter became interested in other genres such as religious painting. He was also passionate about engraving and illustration, collaborating with periodicals like L'Illustration. He is most well-known, however, for his series of pastel and pencil portraits representing soldiers of the Great War. During his military mission in Paris in 1917, he stayed at rue d'Assas, near the seminary of Saint-Sulpice, where passing troops were housed. He drew his first models there and then traveled through France, including Marseille and Montpellier, where the French and British colonial troops were stationed. His models were paid but some refused payment as they considered it an honour. Most are identified by name, some only by rank, unit, or country of origin. Burnand organized his first exhibition of about eighty portraits in May 1919 at the Musée du Luxembourg. Then, with the help of the Allied military authorities, he continued his project by producing a catalog of soldiers who participated in the conflict. He was impressed by the multiplicity of nations involved in the conflict and the variety of cultures represented. He wanted "to study the modern soldier from a psychological point of view” and add to this initial program, more ambitious intentions, such as ethnographic interest. Eugène Burnand's series of soldiers’s portraits was the subject of a book foreworded by the French Marshal Foch, The Allies in the War of the Nations, published in 1922, shortly after his death.